'Math Expression Generator' is an application which generates math expressions taking into considerations supplied parameters. It uses custom defined parameters, base elements and operations which you can freely define to generate the mathematical expression. 'Math Expression Generator' is an application which generates math expressions taking into considerations supplied parameters. It uses custom defined parameters, base elements and operations which you can freely define to generate the mathematical expression. The parameters can be like PARAM_X, PARAM_Y, PARAM_ANYTHING, PARAM_SOMETHING, PARAM_etc. In the end result the application will know to generate X for PARAM_X, Y for PARAM_Y, ANYTHING for PARAM_ANYTHING, SOMETHING for PARAM_SOMETHING, etc for PARAM_etc. The base element is a custom defined string of characters (like sin(PARAM_X), cos(PARAM_Y), myfunction(PARAM_X), func()) which can or cannot have none, one or more parameters attached to it. It is your choice if you want to attach a parameter (or more parameters) to a base element or not. 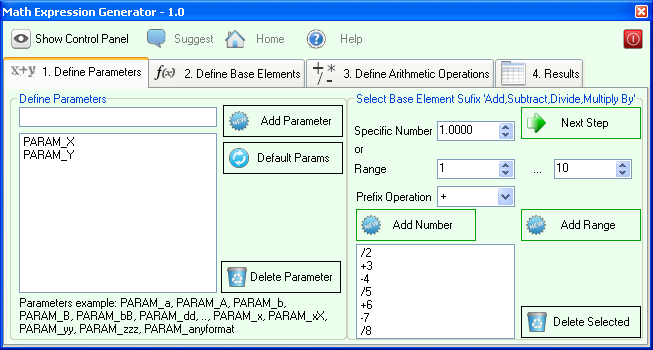 The application generates results using the base elements supplied and if a base element has parameters it will remove the "PARAM_" part from that parameter(s) and leave only the end part. The operations are custom defined strings of characters which unite the base elements when the result is generated. The default operations are +, -, /, * but you can define anything as the operation even words.